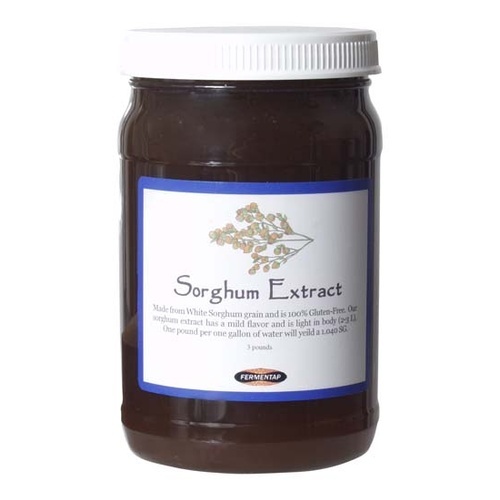 Sorghum Syrup (Extract) 3 lbs. Make your own gluten-free beer at home! Sorghum is gaining popularity as a complete malt substitute in beer. Coeliacs (people allergic to gluten) have to avoid items with gluten in them, including beer. Substituting Sorghum extract for malt extract opens a whole new brewing door for people. It is mild in flavor, light in body (2-3L). One pound per one gallon of water will yield 1.040 SG. We have experimented with this extract, and have found the flavor of sorghum is not like malt at all. It has a light spicy note to it, and the mouthfeel is virtually non-existent. These two things make brewing with 100% Sorghum a nice little challenge. While the result is a drinkable beer, it needs some work. We suggest trying Heather Tips, Honey, Belgian Candi Syrup, and to stay away from "citrusy" hops. You use about 50% less hops when bittering sorghum extract. There are some ingredients that cannot be used in brewing a beer for a person who is allergic to gluten such as specialty grains, malt, liquid yeast and dextrin. If you're allergic to gluten, be sure to check with your doctor before deciding which ingredients are safe for you to use in your beer. Trying it out as an addition to honey for different style mead.